Just finished the second table runner using those black and white blocks I've been saving for the past few years. I made this one just as the first one (see the other table runner here), but using three other blocks with same accent red fabric by Moda for this year's Valentine's. This one I stitched in the ditch only. I can't believe I had enough of the same scrap fabric for the corner yo-yos. I'd much rather use sample blocks for smaller projects than put them in a quilt. I do, however, have a sampler top which would be great for the 4th of July, if only I could find time to quilt it. It has been slumbering in a drawer for 3 years, just waiting for me to bring it to life. 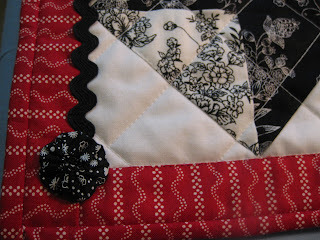 I may just have to quilt it this year, and maybe I will like it once it is finished. In the meantime, this is another project off the list! Yeah!